Today’s featured cake would be gorgeous any time of year, but I’d love to see it in the early spring when the temperatures are still a bit chilly. The cake features three tiers draped in dark, decadent chocolate icing, and you could choose to have different cake flavors under the icing. A simple white flower detail is all this cake needs for a bit of added elegance. No cake topper required here. 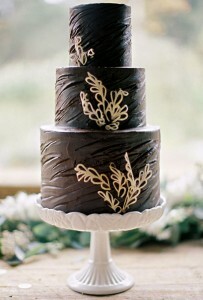 You’ll find this lovely chocolate cake here. It was created by Sweet & Saucy Shop.